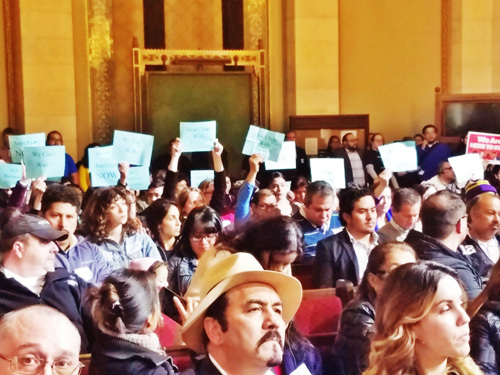 LOS ANGELES – The Los Angeles City Council Wednesday approved three motions aimed at counteracting new federal policies on immigration. In 10-0 votes, the council moved to draw up a plan preparing the city for a possible loss of federal funds; to have the city attorney draft an ordinance that would prevent city employees from participating in any program to register citizens based on their religion; and to move forward with a plan to contribute $2 million to a legal defense fund for immigrants facing deportation. In light of President Donald Trump’s threat to cut federal funding to so-called “sanctuary cities,” the council voted to have staff assemble a list of federal funding the city receives and also draw up a plan to address the budgetary shortfall that would result from the loss of federal funds. While not fitting the typical definition of a sanctuary city, where immigrants residing in the country illegally are shielded from federal authorities, the Los Angeles Police Department for decades has followed Special Order 40, which states officers will not detain a person for the sole purpose of determining their immigration status. The motion in particular mentions Special Order 40 and directs staff to prepare for the possibility that Congress and the president may act to remove federal funds from cities that have similar policies. The council directed the city attorney to draft an ordinance that would prohibit city employees from participating in any program to register individuals based on their religion or spiritual faith, or that would result indiscrimination on those bases. The council also instructed staff to prepare a report on implementing a possible $2 million contribution to a legal defense fund for immigrants in the Los Angeles area facing deportation. The idea for the fund was announced by Mayor Eric Garcetti in December and would total $10 million, with $3 million coming from L.A. County and $5 million from the private sector. The vote on the religious registry comes in response to the idea that Trump may support or implement a registry of all Muslims in the country. Trump was asked about a Muslim registry by reporters during the campaign and on several occasions suggested that he supported the idea. After the election, a spokesman for Trump issued a statement maintaining that the president never advocated for the idea of a Muslim registry. It is unclear if Los Angeles could face a loss of federal funds, since Trump’s executive order declares that sanctuary jurisdictions would be determined by the secretary of the Department of Homeland Security. from helping federal authorities on immigration issues. Trump’s executive order argues that sanctuary jurisdictions harm the country. “These jurisdictions have caused immeasurable harm to the American people and to the very fabric of our Republic,” Trump’s executive order says. Los Angeles Mayor Eric Garcetti and other city leaders appeared at the Islamic Center of Southern California in Koreatown Wednesday to denounce President Donald Trump’s travel ban on seven Muslim-majority nations and offer their support for travelers affected by it. “We must always protect our country and our people from harm, and should take every necessary measure to secure the homeland,” Garcetti said. Trump’s executive order, which he signed Friday, suspends all refugee entries for 120 days, indefinitely blocks all Syrian refugees and bars entry for 90 days to all immigrants from Iran, Iraq, Libya, Somalia, Sudan and Yemen. 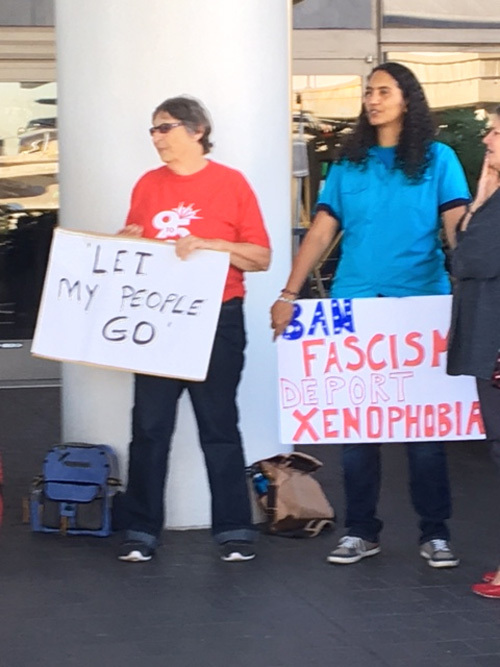 The order sparked protests at airports around the country, including at Los Angeles International Airport, where several thousand protesters shut down vehicle traffic at one point on Sunday. “The Muslim ban has resulted in chaos and trauma for affected families,” Councilman Mitch O’Farrell said. A federal judge in Los Angeles Tuesday issued a restraining order blocking the enforcement of the president’s ban. The temporary restraining order issued by U.S. District Judge Andre Birotte Jr., allows more than two dozen people from Yemen to fly into Los Angeles International Airport from Djibouti, an African country near Yemen where they were stopped from boarding an LAX-bound flight over the weekend. But the order also extended beyond the roughly two dozen plaintiffs, with Birotte also barring immigration officials at LAX from blocking the entry of any person from the seven countries included in Trump’s order, as long as they have valid immigrant visas. City Attorney Mike Feuer also spoke at Wednesday’s event. Feuer said he spent much of Sunday night at the airport, seeking to meet with people who were detained by federal agents as they arrived with valid visas or work permits, but was rebuffed by federal agents. “We must stand up for an America that embraces refugees, unites families and respects basic rights,” Feuer said. Trump has defended his order as necessary to protect the country from terrorists. Board members at the Islamic Center said many Muslims in Los Angeles are concerned about their families being split up due to Trump’s order. The Islamic Center also announced plans to hold a rally on Feb. 19. The country will be holding its collective breath Friday as Donald Trump is sworn in as the 45th president of the United States. In keeping with tradition, the inauguration will be filled with pomp and circumstance, including a parade and grand balls and parties attended by many of the country’s elite and dignitaries from around the world. But many across the country, fans and detractors alike, will spend this inauguration weekend waiting for the next shoe to drop in the constant turmoil and unrest that seems to follow our soon-to-be-president. From all over the U.S., trains, cars, bused and planes will carry loads of people headed to the nation’s capital to take part in inauguration activities – which this time around will also include what some speculate will be an unprecedented number of protests. Whether here at home or in Washington D.C., for many the next few days will be filled with anticipation or anxiety as the mystery of what a Donald Trump presidency means to regular people continues. Mr. Trump has said he will continue to use Twitter to communicate with the American people, bypassing traditional and informative communication tools like press conferences with the media, which he calls “dishonest” and “very unfair” to him. Because our next president has such a strong aversion to providing details on the myriad of proposals and presidential actions he says he will undertake to “make America great again,” it seems that the people he was elected to serve will have to ascertain his policies by putting together clues from his Tweets, 140 characters at a time. We wonder if when Mr. Trump takes the Oath of Office, will he deliver a strong “I do,” or will he add a caveat? And what about his acceptance speech? Will it put forth a vision for the country that will inspire Americans to leave behind the anti-immigrant, xenophobic, misogynist and anti-media rhetoric that took root during his campaign for the country’s highest office, bitterly dividing the country? Or will he continue these attacks and continue to antagonize both our allies and our enemies? And what about on Monday, his first official “business” day in office, will President Trump finally unveil details of his plan to replace his predecessor’s landmark health care plan, the Affordable Care Act? Will Monday bring a start to his promise to deport the millions of people in the country without legal status, including the 750,000 Dreamers who were brought to the country illegally as children, have grown up here and call the U.S. their home? While many were inspired by his campaign rhetoric promising tremendous change, his success will rely on the details that have so far evaded a public airing. Republican lawmakers have already pushed through their plans to cut Medicaid by $14 billion, as Trump said he would do. It is our hope that both the president and Republican Congress will think long and hard about how they proceed, and that they spend more time focusing on building than destroying. We don’t believe that the millions of Americans who voted against Trump for president and even some who voted for him, are in the mood to accept the prospect of losing any of the rights, freedoms or benefits they now enjoy. We are holding our breath as we wait to hear what the new administration means when it says all American will have access to health care insurance, because they seem to be forgetting the ‘affordable’ part of that phrase. Americans have many ways to influence the Senate and the House of Representatives, including writing their representatives and telling them they do not approve of their actions. Over the next few days, people all over the country will take to the street to protest what they fear will be Trump following through on promises to dismantle many of the gains made during the last 8 years. We urge them to voice their concerns loudly, as is their constitutional right and privilege, but to do it responsibly without tearing apart this place we call home. Lastly, the fact is that mid-term elections take place in two years, and the most important thing any of us can do in preparation – whether you are a Trump supporter or not – is to stay informed and vote. Republicans have a super majority in both the House and Senate, but that could change the next time we go to the polls. During his first press conference as President-elect Wednesday, Donald Trump denied any involvement in cyber attacks by Russia during the election as suggested by an intelligence report published by some news organizations. At the same time, he lashed out again at certain media outlets, calling one “trash” and repeatedly ignoring a reporter’s questions. “A thing like that should have never been written, it should never have been had and it should certainly never been released,” Trump said referring to an intelligence report that points to him as a possible accomplice in Russia’s hackings of American information systems. “President (Vladimir) Putin and Russia put out a statement today that this fake news was indeed fake news. They said it totally never happened,” Trump said to the hundreds of reporters gathered for his first press conference in months. The president-elect also harshly criticized news outlets that published the information Tuesday, among them Buzzfeed and CNN. He deemed it a “scandal” for that document to have seen the light of day. “Buzzfeed is a failing pile of garbage”, Trump said, adding that CNN is “going out of their way to build it up” referring to the accusations of the deals with Russia. “Not you. Your organization is terrible. Quiet. Don’t be rude. No, I’m not going to give you a question. You are fake news,” Trump said to reporter Jim Acosta as he attempted to ask if Trump could deny that neither of his campaign officials has met with Russian representatives before the November 8 elections. Another journalist finally was able to address the question to which Trump did not respond clearly. For the first time, however, Trump did say that Moscow is responsible for hacking the Democratic Party during the Presidential Election, but went on to criticize the party and government agencies for their lax security in preventing such intrusions. “Hacking is bad and it shouldn’t be done,” Trump affirmed. “As far as hacking, I think it was Russia,” the president-elect said, accepting the findings of intelligence agencies that the Russian government was behind the release of damaging information retrieved from Democratic Party emails. Trump said such intrusions would not take place once his administration takes over, adding that he has put together a team of highly reputable cyber security experts to make sure Russia, China and any other hackers are stopped. “We have some of the greatest computer minds anywhere in the world that we’ve assembled … and we’re going to put those minds together and we’re going to form a defense,” he explained. As for the wall he promised to build along the U.S.-Mexico border, Trump insisted that he will follow through and that Mexico will pay for it, in one form or another. “I don’t feel like waiting a year or a year-and-a-half,” he said, adding he plans to move on it quickly. “Mexico in some form…will reimburse us for the cost of the wall…whether it’s a tax or whether it’s a payment. But it will happen,” he emphasized. Trump also sought to clarify that he will give up control of his businesses, turning them over to his two adult sons and a business partner, but added he will not sell his brand or give up his assets. “My two sons (Donald Jr. and Eric) will continue to oversee my company in a professional manner, and they will not consult anything with me,” he clarified as he stood in front of a pile of manila folders that he said contain the details of his decision. His lawyer, Sheri Dillon, further explained that the Trump’s businesses will not establish new business deals overseas during his presidency and that the domestic operations will be scrutinized to avoid conflicts of interest. In 2015, the authorities in California documented 837 hate-crime incidents, charting a surge in offenses motivated by religious intolerance toward Muslims and Jews, while crimes against Latinos grew by 35 percent. Last week, shortly after Donald J. Trump was elected the country’s next president, the Southern Poverty Law Center put up a form on its website encouraging people to share details about potential hate crimes. By the next day, they’d received about 250 reports – more than they’re used to seeing in six months. Then on Monday, the FBI released its latest national tabulation of hate crimes, data that showed an overall uptick of 6.8 percent from 2014 to 2015. The accounting, drawn from information passed on to the bureau by state and local law enforcement agencies, charted a 67-percent increase in anti-Muslim hate crimes. But even in the early stages of what promises to be a prolonged focus on crimes colored by prejudice and politics, there appears to be one irrefutable truth: the data is deeply flawed. James Comey, the director of the FBI, said as much even as he announced the bureau’s latest batch of numbers. “We need to do a better job of tracking and reporting hate crimes to fully understand what is happening in our communities and how to stop it,” Comey said. More than 3,000 state and local law enforcement agencies don’t report hate crimes to the FBI as part of its annual national survey of crime in America. Professor Brian Levin, who heads the Center for the Study of Hate and Extremism at California State University, San Bernardino, said the entire state of Hawaii fails to file any such reports. And many of the law enforcement agencies that do choose to participate do not appear to be particularly rigorous about documenting hate crimes and passing that information onto the federal authorities. “A lot of agencies just submit a piece of paper saying they had no hate crimes,” added Levin, noting that the vast majority of police and sheriff’s departments reported no hate crimes last year. The data appears particularly spotty in much of the South, a region with a long history of racial strife. Police in Mississippi reported zero hate crimes in 2015. In Arkansas, the number was eight. In Alabama, it was 12. It seems the number of hate crimes on college campuses is also undercounted by the FBI. The most recent statistics gathered by the U.S. Department of Education appear to show at least twice as many offenses occurring at colleges and universities as the FBI data. A key problem, said Phyllis Gerstenfeld, author of a well-known book on hate crimes, is that the FBI has no legal mechanism to compel law enforcement agencies to file crime reports or ensure that they submit accurate information. Still, some states are doing an admirable job, noted Gerstenfeld, a criminology professor at California State University, Stanislaus. In California, for example, police officers receive training on hate crimes as part of their initial education at the police academy, which can help officers identify bigotry-driven offenses. California law requires police and sheriff’s deputies to closely monitor hate crimes and share their findings with both the California Attorney General and the FBI. In total, the FBI documented 5,850 hate-crime incidents in the report it issued Monday, most targeting people on the basis of race or ethnicity, religious affiliation or sexual orientation. For some, the surge in crimes against Muslims was not surprising. “It confirms what we’ve been seeing on the ground since late last year – a spike in hate crimes against Muslims,” said Ibrahim Hooper, communications director for the Council on American-Islamic Relations, an advocacy group. Since Trump claimed the presidency on Nov. 8, social media has been deluged with first-person accounts of racist incidents and attacks on Muslims, prompting BuzzFeed to compile a listicle titled “Here Are 26 Reported Racist Incidents After Donald Trump’s Victory.” This catalog of abuse included graffiti (lots of swastikas, and, in upstate New York, an exhortation to “Make America White Again”); violence (an African-American college student assaulted in Ohio); and intimidation in myriad forms (black students receiving online invitations to a lynching in Pennsylvania, a Muslim woman who was told “Your time’s up, girlie” on the New York subway, etc.). Oren Segal, the director of the Anti-Defamation League’s Center on Extremism, believes it’s too early to tell if reports are higher than normal because incidents are happening more frequently or because people are simply more aware of them. But he said the direct connection to a single politician is unique. “The fact that so much of it is being linked to our presidential campaign is very, very disturbing,” he said. Heidi Beirich, director of the SPLC’s Intelligence Project, agreed. A.C. Thompson covers criminal justice issues for ProPublica. He has been a reporter for 12 years, mostly in the San Francisco Bay area. Ken Schwencke is a journalist and developer building news apps for ProPublica’s Electionland project. See his full article here.